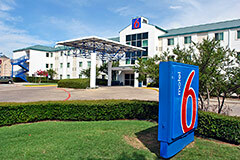 Located just .5 miles from the airport near Esters Blvd. off John Carpenter Freeway. We provide safe and affordable airport parking with FREE shuttle service to and from the airport! Reservations must be made online in order to take advantage of this internet-only special parking rate. Address will be provided on the confirmation. Parking Instructions: Please select any parking spot available at the sides of the building. Enter the lobby & do a brief parking check-in at the front desk.